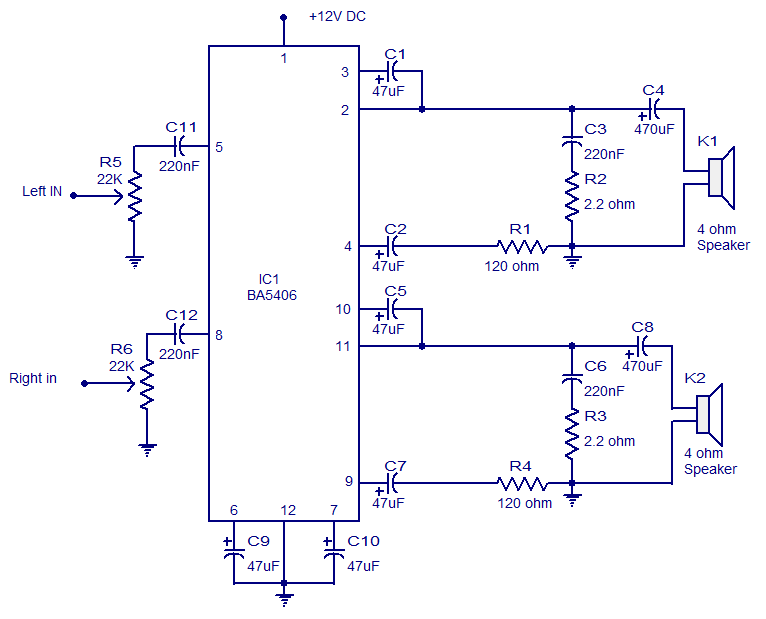 In the this circuit diagram, BA5406 is configured to deliver 5 x 2 watts at 4 ohm speakers to a supply voltage of 9 volts. The capacitor C3 is a power supply filter capacitor. C11 and C12 are decoupling capacitors DC input for the left and right. C3 and R2 form a Zobel network to output the left, while C6 and R3 is the same for the right channel. Zobel network purpose is to reduce vibrations and improve the high frequency stability of the amplifier. Potentiometers R5 and R6 serves as a volume control for left and right channels. C8 pair CapacitorsC4 and the amplifier outputs to the speakers. C9 and C10 are the noise filtering capacitors. C1 and C5 are starting capacitors for left and right channels. BA5406 requires a proper heat sink. 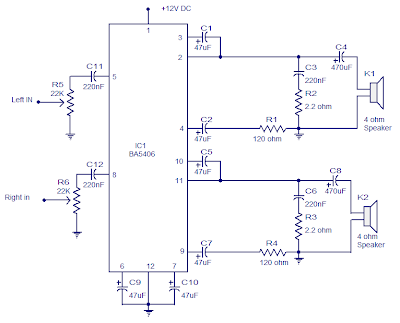 Supply voltage range is 5 to 15V DC. I used 9V DC for powering the amplifier.